Sign up for our regular placemaking newsletter full of resources, news, and opportunities, as well as occasional updates from Project for Public Spaces. Oops! It appears either something went wrong or you are already a subscriber. Please contact info@pps.org. In Nairobi, Kenya, the contrast between rich and poor neighborhoods is beyond stark. And even though half of the city’s population lives on a mere 1.5% of the total land area, in Nairobi, public space is scarce. Since the creation, by Colonial powers in 1948, of the master plan that led to the formation of the city we now know today, little to no provision has been made for well structured common spaces for much-needed programming, activity, and services. In that same period, the city's population has ballooned from 120,000 to more than 3.1 million people--and that's just the official number! Nairobi is home to many informal settlements, where it's very difficult to take an exact head count. One of the most well-known of these settlements is Kibera, a massive slum comprised of 13 separate villages where most residents get by on less than a dollar a day. It is here where PPS has joined forces with UN-Habitat, the City Council of Nairobi, and local partners including the Kilimanjaro Initiative, KENSUP (the National Housing branch of the Kenyan Government), Chief of SOWETO (South West Township) in Kibera, and the Undugu Foundation, for one of two pilot projects in the city's effort to create 60 great public spaces over the next several years. Earlier this year in Kibera's Silanga village neighborhood, PPS's Cynthia Nikitin and Board Member Vanessa September met with community members to conduct a Placemaking workshop to generate ideas and support for the next phase of improvements to a soccer field that serves as an important recreation facility for this long-underserved community. 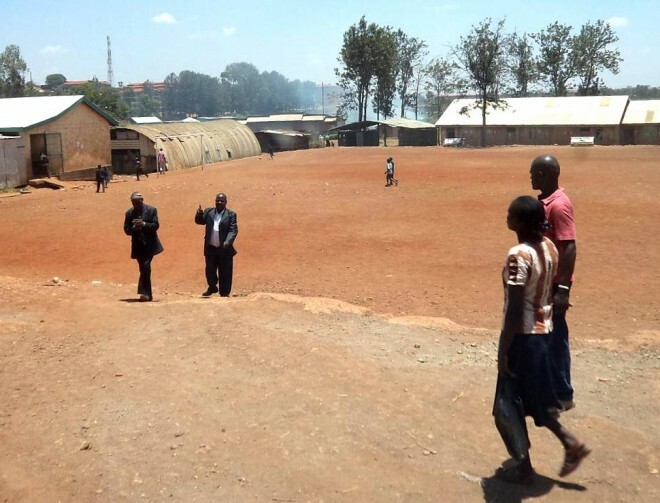 Today residents continue to work toward the transformation of Silanga Field (which contains school facilities, a meeting room, a pottery studio, and other important resources) into what they have agreed, collectively, to re-name the Silanga Community Centre. "I have taken great delight in the confidence that is being displayed by the team in how they have taken ownership of the projects," wrote PPS board member Vanessa September (who continues to work on the ground with partners) in a recent email. "If they have 58 more spaces to do, then the sooner they take ownership, the better!" We have written previously on the Placemaking Blog about how dangerous social conditions produce alienating public spaces in developing world cities, especially for women. In Kibera, the desire for a safe and welcoming space for the community very clearly influences recommendations for everything from comfort to accessibility. A variety of Lighter, Quicker, Cheaper improvements are included in an as-yet-unpublished report detailing recommendations generated through the Placemaking process, with many of them focused specifically on creating a safe space for people to gather. From using fences to define the perimeter of the site (and designate entrance and exit points), to programming the space, very intentionally, with local security meetings and social programs focused on youth and good parenting, the focus on safety plays a critical role. "The best way to make a public space safe," the report suggests, "is by creating positive activities in and enhancing wider citizen ownership of the space." We often say that public spaces reflect the communities that surround them; this can be both a good thing, and a bad thing. In Nairobi, the lack of adequate public spaces reflects the stark social divisions across the city and, worse yet, reinforces them. Since Nairobians rarely come into contact with people from different socioeconomic groups, there is little upward mobility for people in places like Kibera—diminishing one of the chief benefits of urban agglomeration. The lack of space communicates to these people that their presence is undesirable. This contributes directly to the sense of isolation and desperation that makes for more dangerous neighborhoods. In wealthy areas, meanwhile, fear of the violence created by this tension leads to more fortress-like compounds and walled golf courses when what the city really needs are great public spaces, and shared destinations where people from different neighborhoods and backgrounds can take part in the formation of a shared civic identity. Spaces like the Silanga Community Centre are steps toward a stronger Nairobi. Presently, the UN-Habitat is working with local partners to accurately survey the site, and prepare for the RFP process in order to push forward on Silanga Field's reconstruction. The newly appointed City Planning Director, Mrs. Rose Muema, recently presented on progress at the site both at the World Urban Forum in Naples Italy and more recently to major donors from Norway, Sweden, and Spain, "[stressing] the importance of participatory approaches to development." Recieve weekly placemaking newsletters and stay in the loop with the movement. Advance the cause of public spaces and placemaking around the world.